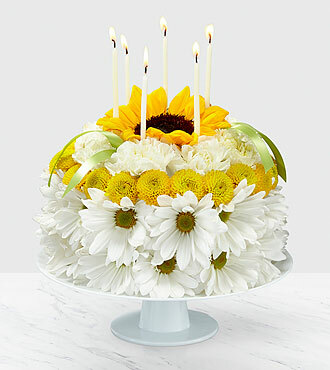 Blow out the candles, and help make it their brightest birthday yet with our Birthday Smiles Floral Cake. This one-of-a-kind arrangement is frosted with a collection of bright sunflowers, yellow button pompons, white daisy pompons and white carnations. Topped with birthday candles and satin ribbon, this unique gift will bring a smile to their face and make it a truly memorable celebration.